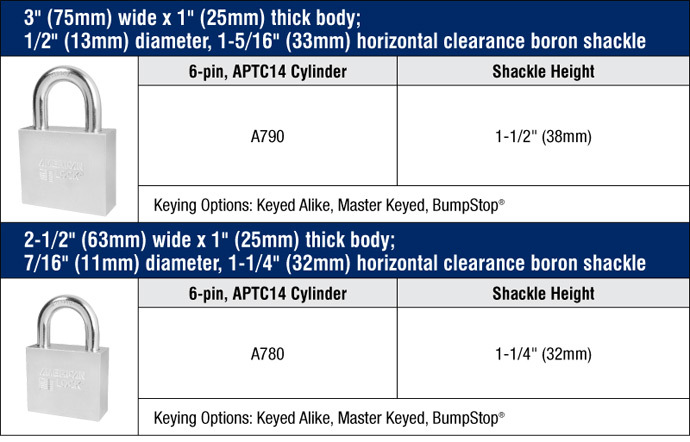 These solid steel padlocks — with the largest lock bodies and shackles to best withstand physical attack — are virtually indestructible, with hardened, chrome plated solid steel bodies that resist cutting, sawing and corrosion; hardened boron alloy steel shackles for superior cut resistance; and stainless steel cylinder pins for increased drill resistance. Hardened stainless steel serrated pins increase the drill and pick resistance of the rekeyable five- and six-pin brass cylinders. The dual ball bearing locking mechanisms resist pulling and prying. Includes A780, A784 and A790, with specifications listed below.